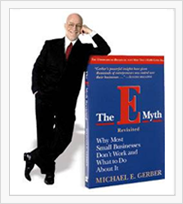 What is The E-Myth Mastery Program? Mastery is a business development program that helps you turn your company into a world-class operation…into a turn-key money machine! E-Myth Mastery provides a turbo-charged curriculum that includes your own private teacher. It’s useful, practical, real-world knowledge that’s implemented real-time into your business. Think of the Mastery Program as a long-distance, working-person’s MBA, without the expensive price tag. Imagine not having to work so hard…being able to run your business instead of having the business run you. Imagine your money growing in gross revenues, net profits and owner’s equity, and most important of all-in personal income for you-more than you’ve ever been able to pay yourself before. Imagine discovering a system of proven results, no matter what your business. We present each of these seven skills through a specific training module with corresponding audio, and the essential E-Myth workbooks. 47 workbooks explain the content and principles to be learned, provide case studies and examples, as well as worksheets for applying those ideas to your business. What entrepreneurs do that technicians don’t do. How to get money when the bank won’t give it to you. How to expand your customer base when Big Business moves in down the street. How to develop the best people when you can’t afford to pay them competitive wages. How to increase the predictability of what your business is able to promise, and then how to keep that promise, every single time, no matter where you are or what you’re doing. Integral to the Mastery process of learning is a coach who individually mentors candidates–every step of the way. We provide all coaching via phone, fax, mail and modem. Coaches are even available for hot-line support between meetings. Working together, we can accomplish even greater goals than you first envisioned when you launched your business. We’re so sure you’ll be pleased with our program that we don’t require a long-term contract. We Tailor the Program to suit your business needs. We pick and choose the Modules that your business needs at the time to get the most impact. Pricing – Your Achilles Heel?